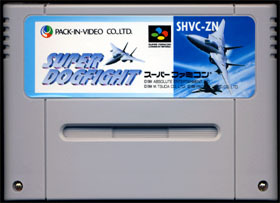 Super Dogfight F14 (aka Turn And Burn No Flight Zone in the west) is an air combat shooter published by Pack-In-Video. The player gets to pilot an F-14 Tomcat fighter armed with a M61A1 Vulcan 20mm cannon and radar guided infrared missiles. Most of the action takes place in Mediterranean region and missions are usually flown over the ocean. Each sortie gets the player to be launched from an aircraft carrier and to fight Mig-29 enemy fighters over a protected airspace zone. An AWACS operational radar grid is available and gives access to a vast array of information such as enemy fighters location but also submarines and refueling aircrafts. Along with straight attacks, enemy fighters may also shoot air-to-air missiles at the player, and electronic countermeasures and escape maneuvers must be used to avoid being hit. As a side note, a Co-Pilot mode gives a second player the opportunity to take control of the weapon and computer system in order to lighten the load on the first player. Once the mission is over, the player must safely land back on the air carrier to replenish fuel and weaponry, and begin to prepare for the next mission. A password system is used to restore a saved game. A Game Boy version of Turn and Burn: No Fly Zone was also released in 1992 in the United States, and published by Absolute Entertainment. Take off from your carrier and get ready for 16MEG supersonic action with TURN AND BURN:NO-FLY ZONE(TM)! Strapped into the cockpit of the Navy's sleek and lethal F-14 Tomcat jet fighter, you'll fly blue water operations against a fully-rotational Mode 7 horizon and search the heaves for your prey with an impressive array of avionic technology! Unparalleled 16-bit sound barrier-blasting dogfights make for a senses-shattering combat simulation that will blow you away! You've never experienced air-to-air battles like these before-- unless you've flown the real thing! Ok, I was really pessimistic at first. After all, Pack-In-Video is not clearly the kind of publisher that usually aspires to greatness. Already the first minutes of play promised more than I expected. The action is intense and the Mode 7 is cleverly used throughout the game. The front and back viewpoint from the cockpit is also a great feature and puts a lot of stress on the player, especially when a missile is locked onto the F-14 and must be destroyed. However, compared to modern flight simulators, this game doesn't stand a chance. Then all the missions happen over the ocean which is a major let down. 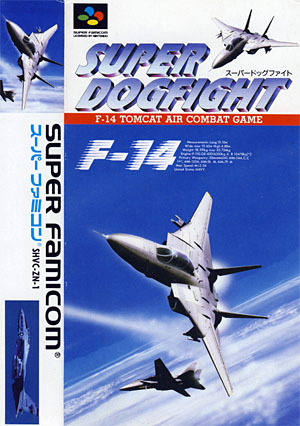 So all in all Super Dogfight F14 is a correct and responsive air combat shooter reminicent of the good old days of the 16bit era, but that may not impress the new comers used to more immersive 3D graphics.